Would all those folks who so revel in calling folks like me "anti-science" (Dr. Michael Mann being foremost among them) please stop using cooling tower steam plumes as an illustration of CO2 production? Not only is steam not pollution (though it sortof kindof can be made to look like it if you photoshop it right), but the cooling towers so often featured in these shots are not even emitting combustion products at all. Did CLOUD Just Rain on the Global Warming Parade? Today in Forbes, I have an article bringing the layman up to speed on Henrik Svensmark and this theory of cosmic ray cloud seeding. Since his theory helped explain some 20th century warming via natural effects rather than anthropogenic ones, he and fellow researchers have face an uphill climb even getting funding to test his hypothesis. But today, CERN in Geneva has released study results confirming most of Svensmark's hypothesis, though crucially, it is impossible to infer from this work how much of 20th century temperature changes can be traced to the effect (this is the same problem global warming alarmists face -- CO2 greenhouse warming can be demonstrated in a lab, but its hard to figure out its actual effect in a complex climate system). Much of the debate revolves around the role of the sun, and though holding opposing positions, both skeptics and alarmists have had good points in the debate. Skeptics have argued that it is absurd to downplay the role of the sun, as it is the energy source driving the entire climate system. Michael Mann notwithstanding, there is good evidence that unusually cold periods have been recorded in times of reduced solar activity, and that the warming of the second half of the 20th century has coincided with a series of unusually strong solar cycles. 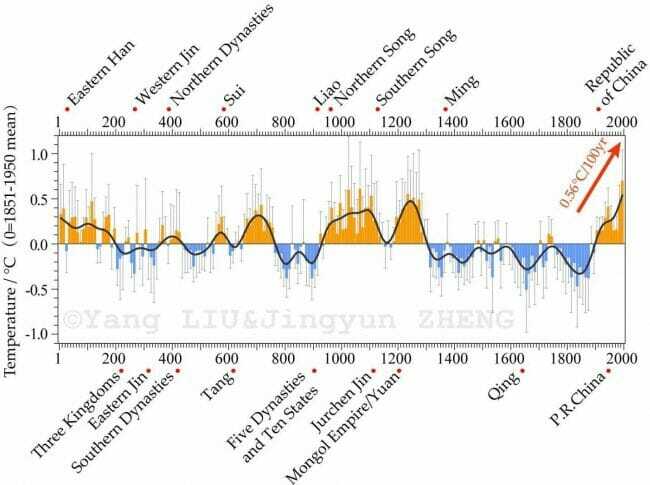 Global warming advocates have responded, in turn, that while the sun has indeed been more active in the last half of the century, the actual percentage change in solar irradiance is tiny, and hardly seems large enough to explain measured increases in temperatures and ocean heat content. And thus the debate stood, until a Danish scientist named Henrik Svensmark suggested something outrageous -- that cosmic rays might seed cloud formation. The implications, if true, had potentially enormous implications for the debate about natural causes of warming. When the sun is very active, it can be thought of as pushing away cosmic rays from the Earth, reducing their incidence. When the sun is less active, we see more cosmic rays. This is fairly well understood. But if Svensmark was correct, it would mean that periods of high solar output should coincide with reduced cloud formation (due to reduced cosmic race incidence), which in turn would have a warming effect on the Earth, since less sunlight would be reflected back into space before hitting the Earth. Here was a theory, then, that would increase the theoretical impact on climate of an active sun, and better explain why solar irradiance changes might be underestimating the effect of solar output changes on climate and temperatures. I go on to discuss the recent CERN CLOUD study and what it has apparently found. Regular readers will have no doubts about my skepticism of the theory of catastrophic man-made global warming. In particular, in these pages and at Climate Skeptic, I have repeatedly criticized the details of Michael Mann's work on the hockey stick. I won't repeat those issues today, though some of the past articles are indexed here. 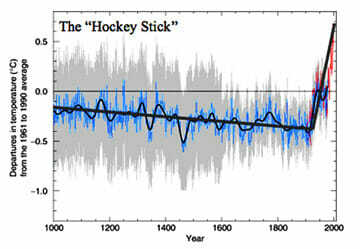 [As an aside, this is actually NOT what Mann's hockey stick work purports to show. The point of the hockey stick is to make the case that historic temperatures before 1850 were incredibly stable and flat, and thus recent increases of 0.6-0.8C over the last 150 years are unprecedented in comparison. His research added nothing to our knowledge about recent warming, it was on focused on pre-industrial warming. The same folks that say with confidence the science is settled don't even understand it]. For those frustrated with just how bad Mann's work is and upset at the incredible effort to protect this work from criticism or scrutiny by hiding key data (as documented in the East Anglia climategate emails), I know it must feel good to get some sort of public retribution. But the potential precedent here of bringing up scientists on charges essentially for sloppy or incorrect work is awful. Bad science happens all the time, completely absent any evil conspiracies. Human nature is to see only the data that confirms ones hypotheses and, if possible, to resists scrutiny and criticism. This happens all the time in science and if we started hauling everyone into court or into a Senate committee, we have half of academia there (and then likely the other half when the party in power changed). Team politics are a terrible disease and the last thing we need is to drag them any further into science and academia. Science will eventually right itself, and what is needed is simply the time and openness to allow adversarial scrutiny and replication within academia to run its course. Seriously, are we next going to drag the cold fusion guys in to court? How about all the folks in the geology field that resisted plate tectonics for so long. Will we call to account the losers in the string theory debate? Ensure that state funding is distributed in a way to support a rich dialog on multiple sides of contested scientific issues. Believe it or not, I am not going to update on the CRU emails. The insights into the science process are illuminating, and confirm much that we have suspected, but faults in transparency do not automatically win the game -- they lead to [hopefully] future transparency which then allows for better criticism and/or replication of the work. My frustration today is a recent article in Scientific American [with the lofty academic title "Seven Answers to Climate Contrarian Nonsense"] which purports to shoot down the seven key skeptics arguments. Many others have shown how the author does not do a very good job of shooting down these seven, but that is not my main frustration. The problem is that, like many of the global warming myth buster articles like this, the author completely fails to address the best, core arguments of skeptics, preferring to snipe around at easier prey at the margins. In this post, I discuss his article and suggest 7 better propositions alarmists should, but never do, address. You can see discussion of all of these in my recent lecture, on video here. Don't have 90 minutes? Richard Lindzen of MIT has a great summary in the WSJ that mirrors a lot of what I delve into in my video. Claim A: Nearly every scientist, skeptic and alarmist alike, agree that the first order warming from CO2 is small. Catastrophic forecasts that demand immediate government action are based on a second theory that the climate temperature system is dominated by positive feedback. There is little understanding of these feedbacks, at least in their net effect, and no basis for assuming feedbacks in a long-term stable system are strongly net positive. As a note, the claim is that the net feedbacks are not positive, so demonstration of single one-off positive feedbacks, like ice albedo, are not sufficient to disprove this claim. In particular, the role of the water cycle and cloud formation are very much in dispute. Claim B: At no point have climate scientists ever reconciled the claims of the dendroclimatologists like Michael Mann that world temperatures were incredibly stable for thousands of years before man burned fossil fuels with the claim that the climate system is driven by very high net positive feedbacks. There is nothing in the feedback assumptions that applies uniquely to CO2 forcing, so these feedbacks, if they exist today, should have existed in the past and almost certainly have made temperatures highly variable, if not unstable. Claim C: On its face, the climate model assumptions (including high positive feedbacks) of substantial warming from small changes in CO2 are inconsistent with relatively modest past warming. Scientists use what is essentially an arbitrary plug variable to handle this, assuming anthropogenic aerosols have historically masked what would be higher past warming levels. The arbitrariness of the plug is obvious given that most models include a cooling effect of aerosols in direct proportion to their warming effect from CO2, two phenomenon that should not be linked in nature, but are linked if modelers are trying to force their climate models to balance. Further, since aerosols are short lived and only cover about 10% of the globe's surface in any volume, nearly heroic levels of cooling effects must be assumed, since it takes 10C of cooling from the 10% area of effect to get 1C cooling in the global averages. Claim D: The key issue is the effect of CO2 vs. other effects in the complex climate system. We know CO2 causes some warming in a lab, but how much on the real earth? The main evidence climate scientists have is that their climate models are unable to replicate the warming from 1975-1998 without the use of man-made CO2 -- in other words, they claim their models are unable to replicate the warming with natural factors alone. But these models are not anywhere near good enough to be relied on for this conclusion, particularly since they admittedly leave out any number of natural factors, such as ocean cycles and longer term cycles like the one that drove the little ice age, and admit to not understanding many others, such as cloud formation. Claim E: There are multiple alternate explanations for the 1975-1998 warming other than manmade CO2. All likely contributed (along with CO2) but it there is no evidence to give most of the blame to Co2. Other factors include ocean cycles (this corresponded to a PDO warm phase), the sun (this corresponded to the most intense period of the sun in the last 100 years), mankind's land use changes (driving both urban heating effects as well as rural changes with alterations in land use), and a continuing recovery from the Little Ice Age, perhaps the coldest period in the last 5000 years. 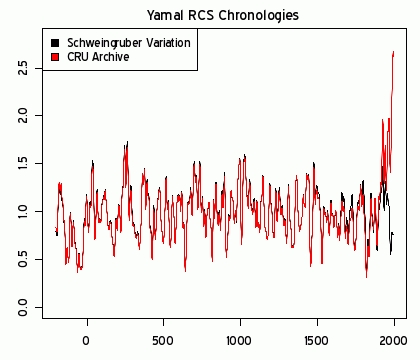 Claim F: Climate scientists claim that the .4-.5C warming from 1975-1998 cannot have been caused natural variations. This has never been reconciled with the fact that the 0.6C warming from 1910 to 1940 was almost certainly due mostly to natural forces. Also, the claim that natural forcings could not have caused a 0.2C per decade warming in the 80's and 90's cannot be reconciled with the the current claimed natural "masking" of anthropogenic warming that must be on the order of 0.2C per decade. Claim G: Climate scientists are embarrassing themselves in the use of the word "climate change." First, the only mechanism ever expressed for CO2 to change climate is via warming. If there is no warming, then CO2 can't be causing climate change by any mechanism anyone has ever suggested. So saying that "climate change is accelerating" (just Google it) when warming has stopped is disingenuous, and a false marketing effort to try to keep the alarm ringing. Second, the attempts by scientists who should know better to identify weather events at the tails of the normal distribution and claim that these are evidence of a shift in the mean of the distribution is ridiculous. There are no long term US trends in droughts or wet weather, nor in global cyclonic activity, nor in US tornadoes. But every drought, hurricane, flood, or tornado is cited as evidence of accelerating climate change (see my ppt slide deck for the data). This is absurd.